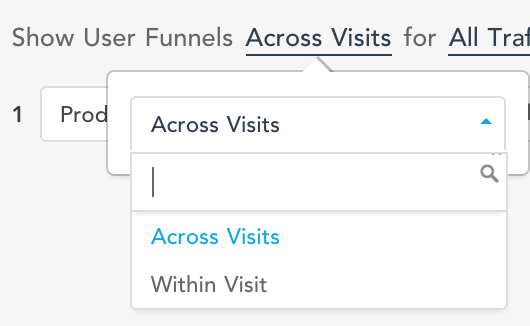 Funnels are a great way to see how users engage across events and channels. When you aren't getting the conversions you expect for a goal, funnels are a great tool to understand where and why users are dropping off. ZAIUS collects data from all different channels and aligns it in one timeline for a user. This allows you to have Funnels that contain steps from different channels. A good example of this is the drop off in the Example 2 funnel above. How do you determine where users drop off between Email Click and Purchase? ZAIUS allows you to build a Funnel like the one below to help determine where the drop off exists. Not all businesses have the same engagement cycles. Some have entire sales cycles in one visit, other have many month long sales cycles. To view how users engage within visits and across visits ZAIUS allow for two different funnel calculations and time windows. User Funnels within visit: How many users completed the funnel within a visit. If a user has two distinct visits both visits could be counted. Each visit resets the funnel. User Funnels across visits: How many users completed the funnel irrespective of visits. A user will only be counted once. Each step is an Expression and you can add as many of these chained together to create a funnel. 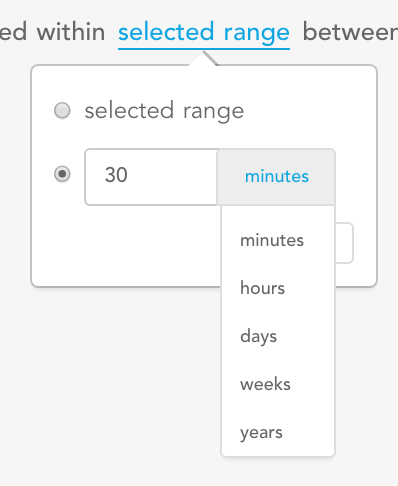 You can scope the time you want all the steps to have occurred by using the "selected range" section. This will evaluate a funnel by all the steps completing in the specified time range.